Le choix de la lame de bistouri n'est pas anodin. Ce travail le confirme et met en avant l'intérêt d'utiliser une lame de 22. Everyone dealing with airway emergencies must be able to accomplish cricothyroidotomy, which cannot be trained in real patients. Training models are necessary. To evaluate the suitability of a hybrid training model combining synthetic and porcine parts to depict variable neck anatomy. Armed Forces Hospital Ulm, Germany, August 2018. On four anatomical neck variations (long slim/long obese/short slim/short obese) we performed two surgicalrapproaches to cricothyroidotomy (SurgiCric II vs. ControlCric). Forty-eight volunteers divided into two groups based on their personal skill level: beginners group and proficient performers group. Time to completion was recorded for each procedure. Once the operator had indicated completion, the correct anatomical tube placement was confirmed by dissection and structures were inspected for complications. Primary outcomes were successful tracheal placement of an airway tube and time needed to achieve a patent airway. Secondary outcome was assessment of complications. Overall, 384 procedures were performed. Median time to completion was 74 s. In total, 284 procedures (74%) resulted in successful ventilation. Time to completion was longer in short obese than in long slim and the risk of unsuccessful procedures was increased in short obese compared with long slim. Even if ControlCric resulted in faster completion of the procedure, its use was less successful and had an increased risk of complications compared with SurgiCric II. Proficient performers group performed faster but had an increased risk of injuring the tracheal wall compared with beginners group. Participants had difficulties in performing cricothyroidotomy in obese models, but various and difficult anatomical situations must be expected in airway management and therefore must be taught. A new hybrid model combining porcine and synthetic materials offers the necessary conditions for the next step in training of surgical airway procedures. A high-fidelity simulator for needle cricothyroidotomy training is not associated with increased proficiency compared with conventional simulators: A randomized controlled study. Katayama A. et Al. Medicine (Baltimore). 2019 Feb;98(8):e14665. L'apprentissage de la coniotomie connait un regain important depuis la publication de l'étude NAP4. Un temps oubliée, ce geste de médecine d'urgence rarement mis en oeuvre est pourtant essentiel à maîtriser non seulement dans un bloc opératoire mais aussi en préhospitalier et tout particulièrement en médecine de guerre où la fréquence des traumatismes ballistiques de la face va croissant. La simulation de ce geste est largement utilisée et des modèles sophistiqués sont proposéss. Il n'est pas certain que ces modèles relativement coûteux aient un intérêt. Un bémol doit cependant être mis. Le modèle "larynx de porc", quoique largement utilisé, ne correspond pas tout à fait à un larynx humain. A high-fidelity task simulator for cricothyroidotomy was created using data from a 3-dimensional (3D) computed tomography scan using a 3D printer. We hypothesized that this high-fidelity cricothyroidotomy simulator results in increased proficiency for needle cricothyroidotomy compared with conventional simulators. Cricothyroidotomy-naive residents were recruited and randomly assigned to 2 groups, including simulation training with a conventional simulator (Group C) and with a high-fidelity simulator (Group 3D). After simulation training, participants performed cricothyroidotomy using an ex vivo porcine larynx fitted with an endoscope to record the procedure. The primary outcomes were success rate and procedure time. The secondary outcome was a subjective measure of the similarity of the simulator to the porcine larynx. Fifty-two residents participated in the study (Group C: n = 27, Group 3D: n = 25). There was no significant difference in the success rate or procedure time between the 2 groups (success rate: P = .24, procedure time: P = .34). There was no significant difference in the similarity of the simulators to the porcine larynx (P = .81). We developed a high-fidelity simulator for cricothyroidotomy from 3D computed tomography data using a 3D printer. This anatomically high-fidelity simulator did not have any advantages compared with conventional dry simulators. Bruijstens L et Al. Laryngoscope Investig Otolaryngol. 2018 Oct 31;3(5):356-363. doi: 10.1002/lio2.183. eCollection 2018 Oct.
Ce travail hollandais met en avant le caractère non anecdotique des accès chirurgicaux aux voies aériennes. Pour les chirurgiens ORL hollandais, il s'agit essentiellement de trachéotomies. Le faible recours à la coniotomie s'explique surtout par le manque d'entraînement et d'équipements spécifiques. L'article souligne l'importance des démarches d'acquisition et de maintien des compétences, ce qui ne doit pas nous étonner. Comme pour les chirurgiens ORL le besoin d'un programme structuré de formations à l'accès aux voies aériennes en condition de combat est un impératif. ENT surgeons and anesthesiologists work closely together in managing challenging airway cases. Sharing knowledge, experiences, and expectations interdisciplinary is essential in order to facilitate decision-making and adequate management in emergency front-of-neck airway cases. A survey was performed, to analyze level of experience, technique of preference, training, knowledge of material and protocols, and self-efficacy scores of Dutch ENT surgeons and residents in performing an urgent or emergency front-of-neck airway. 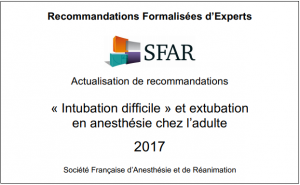 Within one year (January 2014-2015), 25.7% of the 257 respondents had performed an urgent or emergency front-of-neck airway. 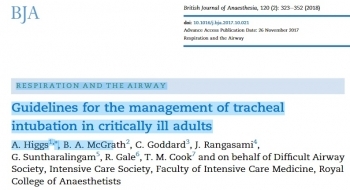 Of all reported emergency front-of-neck airways (N = 30), 80% were managed by tracheotomy. In future emergency front-of-neck airway cases, 74% stated cricothyrotomy would be their technique of preference. The majority would choose an uncuffed large-bore cannula technique. Post-academic hands-on training was attended by 42% of respondents. Self-efficacy scores were highest for surgical tracheotomy, and higher when trained or experienced. In case of an emergency scenario, 8.6% would not perform a front-of-neck airway themselves. The main reasons for reluctance to start in general were lack of experience and lack of training. Reported items for improvement were mainly the development of a protocol and training. The chance of encountering an airway emergency scenario requiring front-of-neck airway is realistic. There is inconsistency between advised technique, technique of preference and technique actually performed by ENT surgeons. This study shows that there is both a need and desire for improvement in training and organization of care. Interdisciplinary guidelines and education is needed and could eventually safe lives. A vertical incision is recommended for cricothyroidotomy when the anatomy is impalpable, but no evidence-based guideline exists regarding optimum site or length. The Difficult Airway Society guidelines, which are based on expert opinion, recommend an 80–100 mm vertical caudad to cephalad incision in the extended neck position. However, the guidelines do not advise the incision commencement point. We sought to determine the minimum incision length and commencement point above the suprasternal notch required to ensure that the cricothyroid membrane would be accessible within its margins. We measured using ultrasound, in 80 subjects (40 males and 40 females) without airway pathology, the distance between the suprasternal notch and the cricothyroid membrane, in the neutral and extended neck positions. We assessed the inclusion of the cricothyroid membrane within theoretical incisions of 0–100 mm in length made at 10 mm intervals above the suprasternal notch. In 80 subjects (40 males and 40 females), the distance ranged from 27 to 105 mm. Movement of the cricothyroid membrane on transition from the neutral to extended neck position varied from 15 mm caudad to 27 mm cephalad. The minimum incision required in the extended position was 70 mm in males and 80 mm in females, commencing 30 mm above the suprasternal notch. An 80 mm incision commencing 30 mm above the suprasternal notch would include all cricothyroid membrane locations in the extended position in patients without airway pathology, which is in keeping with the Difficult Airway Society guidelines recommended incision length. Ultrasound Is Superior to Palpation in Identifying the Cricothyroid Membrane in Subjects with Poorly Defined Neck Landmarks: A Randomized Clinical Trial. Siddiqui N1, et Al. Anesthesiology. 2018 Sep 26. BACKGROUND: Success of a cricothyrotomy is dependent on accurate identification of the cricothyroid membrane. The objective of this study was to compare the accuracy of ultrasonography versus external palpation in localizing the cricothyroid membrane. In total, 223 subjects with abnormal neck anatomy who were scheduled for neck computed-tomography scan at University Health Network hospitals in Toronto, Canada, were randomized into two groups: external palpation and ultrasound. The localization points of the cricothyroid membrane determined by ultrasonography or external palpation were compared to the reference midpoint (computed-tomography point) of the cricothyroid membrane by a radiologist who was blinded to group allocation. Primary outcome was the accuracy in identification of the cricothyroid membrane, which was measured by digital ruler in millimeters from the computed-tomography point to the ultrasound point or external-palpation point. Success was defined as the proportion of accurate attempts within a 5-mm distance from the computed-tomography point to the ultrasound point or external-palpation point. The percentage of accurate attempts was 10-fold greater in the ultrasound than external-palpation group (81% vs. 8%; 95% CI, 63.6 to 81.3%; P < 0.0001). 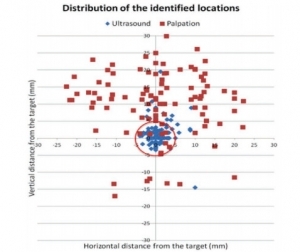 The mean (SD) distance measured from the external-palpation to computed-tomography point was five-fold greater than the ultrasound to the computed-tomography point (16.6 ± 7.5 vs. 3.4 ± 3.3 mm; 95% CI, 11.67 to 14.70; P < 0.0001). Analysis demonstrated that the risk ratio of inaccurate localization of the cricothyroid membrane was 9.14-fold greater with the external palpation than with the ultrasound (P < 0.0001). There were no adverse events observed. In subjects with poorly defined neck landmarks, ultrasonography is more accurate than external palpation in localizing the cricothyroid membrane. Prehospital Rapid Sequence Intubation by Intensive Care Flight Paramedics. Rapid sequence intubation (RSI) is an advanced airway procedure for critically ill or injured patients. Paramedic-performed RSI in the prehospital setting remains controversial, as unsuccessful or poorly conducted RSI is known to result in significant complications. In Victoria, intensive care flight paramedics (ICFPs) have a broad scope of practice including RSI in both the adult and pediatric population. We sought to describe the success rates and characteristics of patients undergoing RSI by ICFPs in Victoria, Australia. A retrospective data review was conducted of adult (≥ 16 years) patients who underwent RSI by an ICFP between January 1, 2011, and December 31, 2016. Data were sourced from the Ambulance Victoria data warehouse. A total of 795 cases were included in analyses, with a mean age of 45 (standard deviation = 19.6) years. The majority of cases involved trauma (71.7%), and most patients were male (70.1%). Neurological pathologies were the most common clinical indication for RSI (68.3%). The first pass success rate of intubation was 89.4%, and the overall success rate was 99.4%. Of the 5 failed intubations (0.6%), all patients were safely returned to spontaneous respiration. Two patients were returned via bag/valve/mask (BVM) support alone, two with BVM and oropharyngeal airway, and one via supraglottic airway. No surgical airways were required. Overall, we observed transient cases of hypotension (5.2%), hypoxemia (1.3%), or both (0.1%) in 6.6% of cases during the RSI procedure. A very high RSI procedural success rate was observed across the study period. This supports the growing recognition that appropriately trained paramedics can perform RSI safely in the prehospital environment. Integration of Point-of-care Ultrasound during Rapid Sequence Intubation in Trauma Resuscitation. Airway and breathing management play critical role in trauma resuscitation. Early identification of esophageal intubation and detection of fatal events is critical. Authors studied the utility of integration of point-of-care ultrasound (POCUS) during different phases of rapid sequence intubation (RSI) in trauma resuscitation. It was prospective, randomized single-centered study conducted at the Emergency Department of a level one trauma center. Patients were divided into ultrasonography (USG) and clinical examination (CE) arm. The objectives were to study the utility of POCUS in endotracheal tube placement and confirmations and identification of potentially fatal conditions as tracheal injury, midline vessels, paratracheal hematoma, vocal cord pathology, pneumothorax, and others during RSI. Patient >1 year of age were included. Time taken for procedure, number of incorrect intubations, and pathologies detected were noted. The data were collected in Microsoft Excel spread sheets and analyzed using Stata (version 11.2, Stata Corp, Texas, U. S. A) software. One hundred and six patients were recruited. The mean time for primary survey USG versus CE arm was (20 ± 10.01 vs. 18 ± 11.03) seconds. USG detected four pneumothorax, one tracheal injury, and one paratracheal hematoma. The mean procedure time USG versus CE arm was (37.3 ± 21.92 vs. 58 ± 32.04) seconds. Eight esophageal intubations were identified in USG arm by POCUS and two in CE arm by EtCO2 values. Integration of POCUS was useful in all three phases of RSI. It identified paratracheal hematoma, tracheal injury, and pneumothorax. It also identified esophageal intubation and confirmed main stem tracheal intubation in less time compared to five-point auscultation and capnography. A Randomized Comparative Assessment of Three Surgical Cricothyrotomy Devices on Airway Mannequins. La réalisation d'une coniotomie peut se faire par voie percutanée avec mandrin souple ou chirurgical, aidée ou pas d'une bougie. L'armée américaine recommande dans sa dernière révision du TCCC le recours à un dispositif appelé control-kit. Les données sur lesquelles reposent une telle proposition sont minces. Ce travail n'est clairement pas en sa faveur, du moins sur le modèle de moulage utilisé pour l'étude. La référence reste donc la technique chirurgicale. Airway obstruction is the second leading cause of preventable battlefield death, at least in part because surgical cricothyrotomy (SC) failure rates remain unacceptably high. Ideally, SC should be a rapid, simple, easily-learned, and reliably-performed procedure. Currently, Tactical Combat Casualty Care (TCCC) has approved three SC devices: The Tactical CricKit® (TCK), Control-Cric™(CC), and Bougie-assisted Technique (BAT). However, no previous studies have compared these devices in application time, application success, user ratings, and user preference. United States Navy Corpsmen (N = 25) were provided 15 minutes of standardized instruction, followed by hands-on practice with each device on airway mannequins. Participants then performed SC with each of the three devices in a randomly assigned sequence. In this within-subjects design, application time, application success, participant ratings, and participant preference data were analyzed using repeated-measures ANOVA, regression, and non-parametric statistics at p < 0.05. Application time for CC (M = 184 sec, 95% CI 144-225 sec) was significantly slower than for BAT (M = 135 sec, 95% CI 113-158 sec, p < 0.03) and TCK (M = 117 sec, 95% CI 93-142 sec, p < 0.005). Success was significantly greater for BAT (76%) than for TCK (40%, p < 0.02) and trended greater than CC (48%, p = 0.07). CC was rated significantly lower than TCK and BAT in ease of application, effectiveness, and reliability (each p < 0.01). User preference was significantly (p < 0.01) higher for TCK (58%) and BAT (42%) than for CC (0%). Improved CC blade design was the most common user suggestion. While this study was limited by the use of mannequins in a laboratory environment, present results indicate that none of these devices was ideal for performing SC. Based on slow application times, low success rates, and user feedback, the Control-Cric™ cannot be recommended until improvements are made to the blade design. A Continuous Quality Improvement Airway Program Results in Sustained Increases in Intubation Success. Airway management is a critical skill for air medical providers, including the use of rapid sequence intubation (RSI) medications. Mediocre success rates and a high incidence of complications has challenged air medical providers to improve training and performance improvement efforts to improve clinical performance. 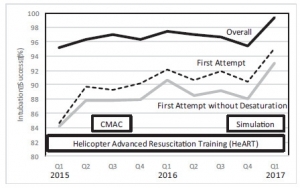 The aim of this research was to describe the experience with a novel, integrated advanced airway management program across a large air medical company and explore the impact of the program on improvement in RSI success. The Helicopter Advanced Resuscitation Training (HeART) program was implemented across 160 bases in 2015. The HeART program includes a novel conceptual framework based on thorough understanding of physiology, critical thinking using a novel algorithm, difficult airway predictive tools, training in the optimal use of specific airway techniques and devices, and integrated performance improvement efforts to address opportunities for improvement. The C-MAC video/direct laryngoscope and high-fidelity human patient simulation laboratories were implemented during the study period. Chi-square test for trend was used to evaluate for improvements in airway management and RSI success (overall intubation success, first-attempt success, first-attempt success without desaturation) over the 25-month study period following HeART implementation. A total of 5,132 patients underwent RSI during the study period. Improvements in first-attempt intubation success (85% to 95%, p < 0.01) and first-attempt success without desaturation (84% to 94%, p < 0.01) were observed. Overall intubation success increased from 95% to 99% over the study period, but the trend was not statistically significant (p = 0.311). An integrated advanced airway management program was successful in improving RSI intubation performance in a large air medical company. L'insertion d'une sonde d'intubation guidée par un mandrin béquillé au travers de la membrane crico-thyroïdienne a été récemment mise en avant (1) Malgré sa simplicité elle apparaît ne pas être indemme de difficulté notamment la possibilité de dommage causé au mandrin par la lame de bistouri lésion qui empêcherait le retrait du mandrin. Un travail qui compare trois techniques de coniotomie (chirurgicale/QuickTrach II/Control Cric). Les auteurs ne mettent pas en évidence de différence flagrante bien qu'ils émettent une préférence très claire pour le QuickTrach II. La coniotomie chirurgicale est celle avec laquelle le moins d'échec est rencontré. On est surpris des résultats très en retrait obtenus avec le Control-Cric qui est le dispositif retenu en première ligne par l'armée américaine. Dans leur discussion, plus que le matériel c'est l'entraînement qui leur paraît déterminant. Cricothyrotomy is a complex procedure with a high rate of complications including failure to cannulate and injury to adjacent anatomy. The Control-Cric™ System and QuickTrach II™ represent two novel devices designed to optimize success and minimize complications with this procedure. This study compares these two devices against a standard open surgical technique. We conducted a randomized crossover study of United States Army combat medics using a synthetic cadaver model. Participants performed a surgical cricothyrotomy using the standard open surgical technique, Control-Cric™ System, and QuickTrach II™ device in a random order. The primary outcome was time to successful cannulation. The secondary outcome was first-attempt success. We also surveyed participants after performing the procedures as to their preferences. Of 70 enrolled subjects, 65 completed all study procedures. Of those that successfully cannulated, the mean times to cannulation were comparable for all three methods: standard 51.0s (95% CI 45.2-56.8), QuickTrach II™ 39.8s (95% CI 31.4-48.2) and the Cric-Control™ 53.6 (95% CI 45.7-61.4). Cannulation failure rates were not significantly different: standard 6.2%, QuickTrach II™ 13.9%, Cric-Control™ 18.5% (p=0.106). First pass success rates were also similar (93.4%, 91.1%, 88.7%, respectively, p=0.670). Of respondents completing the post-study survey, a majority (52.3%) preferred the QuickTrach II™ device. 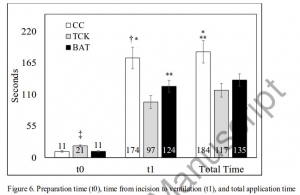 We identified no significant differences between the three cricothyrotomy techniques with regards to time to successful cannulation or first-pass success. Nutbeam T. et Al. Anaesthesia. 2017 May 2. doi: 10.1111/anae.13905. Un travail très intéressant qui met en avant le fait que la hauteur de la membrane cricoïdienne est moindre que ce que l'on pensait, qu'elle est en fait peu dépendante des conditions d'extension du cou et qu'une canule de 6 mm n'est pas celle qui sera insérée le plus facilement. Emergency cricothyrotomy is a common feature in all difficult airway algorithms. It is the final step following a ‘can’t intubate, can’t oxygenate’ scenario. It is rarely performed and has a significant failure rate. There is variation in the reported size of the cricothyroid membrane, especially across population groups. Procedural failure may result from attempting to pass a device with too large an external diameter through the cricothyroid membrane. We aimed to determine the maximum height of the cricothyroid membrane in a UK trauma population. Electronic callipers were used to measure the maximum height of the cricothyroid membrane on 482 reformatted trauma computed tomography scans, 377 (78.2%) of which were in male patients. The mean (SD) height of the cricothyroid membrane, as independently measured by two radiologists, was 7.89 (2.21) mm and 7.88 (2.22) mm in male patients, and 6.00 (1.76) mm and 5.92 (1.71) mm in female patients. The presence of concurrent tracheal intubation or cervical spine immobilisation was found not to have a significant effect on cricothyroid membrane height. The cricothyroid membrane height in the study population was much smaller than that previously reported.Practitioners encountering patients who may require an emergency surgical airway should be aware of these data. Rescue airway equipment with variety of external diameters should be immediately available. 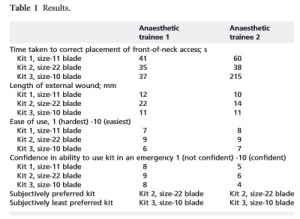 Bystander cricothyroidotomy with household devices - A fresh cadaveric feasibility study. In various motion pictures, medical TV shows and internet chatrooms, non-medical devices were presented as tools for life-saving cricothyroidotomies. However, there is uncertainty about whether it is possible for a bystander to perform a cricothyroidotomy and maintain gas exchange using improvised household items. This study examines the ability of bystanders to carry out an emergency cricothyroidotomy in fresh human cadavers using only a pocket knife and a ballpoint pen. Two commonly available pens and five different pocket knives were used. Ten participants with no or only basic anatomical knowledge had to choose one of the pens and one of the knives and were asked to perform a cricothyroidotomy as quickly as possible after a short introduction. Primary successful outcome was a correct placement of the pen barrel and was determined by the thoracic lifting in a mouth-to-pen resuscitation. Eight (80%) participants performed a successful approach to the upper airway with a thoracic lifting at the end. Five participants performed a cricothyroidotomy and three performed an unintentional tracheotomy. Injuries to muscles and cartilage were common, but no major vascular damage was seen in the post-procedural autopsy. However, mean time in the successful group was 243s. In this cadaveric model, bystanders with variable medical knowledge were able to establish an emergency cricothyroidotomy in 80% of the cases only using a pocketknife and a ballpoint pen. No major complications (particularly injuries of arterial blood vessels or the oesophagus) occurred. Although a pocket knife and ballpoint pen cricothyroidotomy seem a very extreme procedure for a bystander, the results of our study suggest that it is a feasible option in an extreme scenario. For a better outcome, the anatomical landmarks of the neck and the incision techniques should be taught in emergency courses.